If you know me a little, you’ll understand that “not speaking” is not my thing, so soon after I started using twitter. By now I have sent out 871 tweets and have 233 followers. This week I could see the impact. 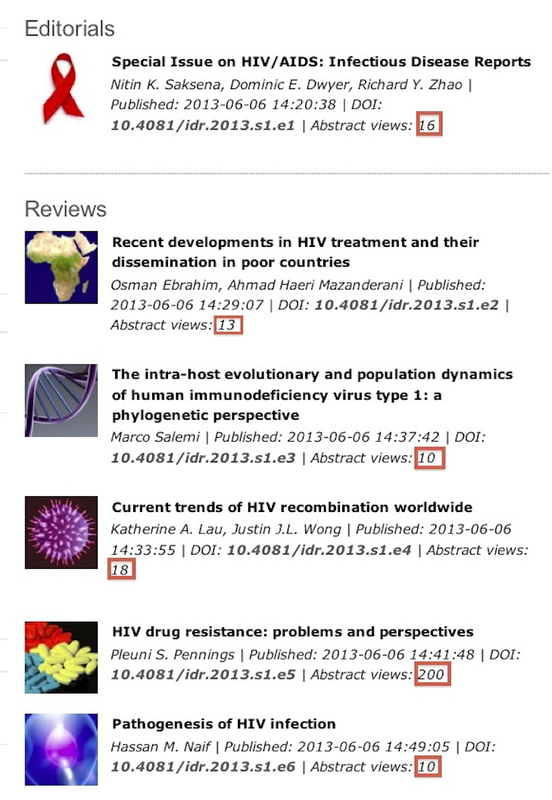 My review paper that came out a few days ago has received 10-20 times more views than the other abstracts that were published in the same issue of the journal! Here is a screenshot from the journal website from this morning (I added the red boxes). I also shared the same link on facebook with some more text. Judging by the visitors of this blog, I know that I get about the same amount of traffic from twitter and facebook. The abstract got about 100 views before my tweet was retweeted (once) and my facebook post was shared (also once). Because the other abstracts had only a handful of views by that time, I assume that almost all views were due to my facebook and twitter activity. I have about 400 followers/friends, which means that one in four of these people clicked on the link on Monday. I find that quite impressive! Of course, clicks on an abstract don’t necessarily translate into people reading my paper, or citing my paper. But then again, the abstract is the first step. Without social media, a paper in a small journal may go almost entirely unnoticed. Last Friday I gave a talk at the de Young museum. I had 20 slides and every slide was shown for exactly 20 seconds. I had exactly 6 minutes and 40 seconds to tell a lay audience a story about my work on HIV and drug resistance. I love this kind of challenge! The format is called Pecha Kucha. I think I spent around two and a half days to prepare the shortest talk I have ever given. I also recorded the talk so if you are curious, you can have a look. Probably the best part of having a fixed number of slides and automated transitions between slides was that out of 5 speakers, no one went over the allotted time! If you’re interested in the full text of the talk, you can download it here: HIVin6minutes. Me in de Young museum, May 2013, picture by Andreas Gros. Disclaimer: I am a computational, evolutionary biologist, not a medical doctor. Whenever I say “we” in this presentation, I mean humankind or all scientists and doctors in the world. The numbers in the presentation are all approximate.